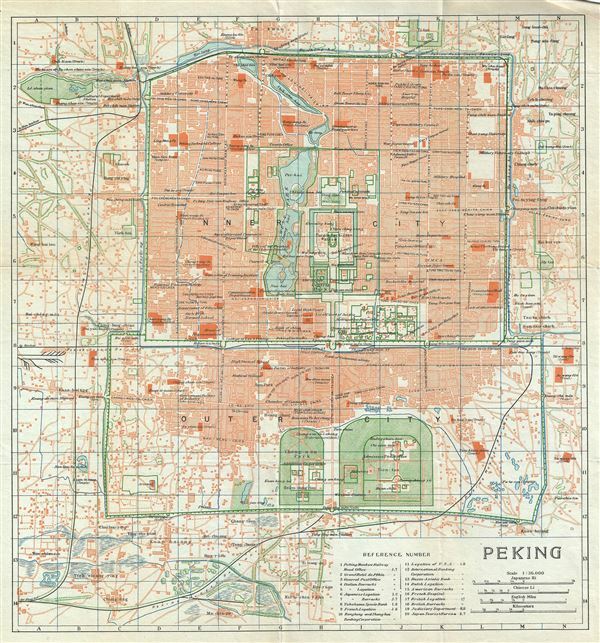 This is a beautiful 1924 railway map of Beijing or Peking issued by the Imperial Japanese Government Railways. It covers Beijing, the last of the four great ancient capitals of China and depicts the walled inner city as well as the outer city of Beijing. This highly detailed map notes streets, lakes, parks, government offices and other topography. The forbidden palace and several other important landmarks are identified. Notes several railways. This map was issued as part of the 1924 Official Series Vol. D of the Guide to China and printed at the Toppan Printing Company.